It all started with a spur of the moment idea late one night in Brisbane. Emmanuel Drivas and Emmanuel Kokoris had enjoyed dinner together. Now they decided it was time for a coffee. The question was “where?’ and they couldn’t come up with an answer. Then it hit them: if they were searching for a place to enjoy coffee, there were probably plenty of others in the same boat. Research, long days and late nights followed as the pair planned a new business venture: The Coffee Club. Their idea was to create more than just a place where people could go for a coffee. It was to provide meeting places that were casual yet sophisticated, stylish yet affordable. In short, their plan was to meet an untapped need in the Australian hospitality marketplace. At first The Coffee Club opened in 1989 in Brisbane’s magnificent Eagle Street Pier complex on the banks of the Brisbane River. The founding Directors’ hard work paid off, because it met with instant success. Following soon after, The Coffee Club expanded and today they are found all over Australia providing good food, great service, and excellent coffee. 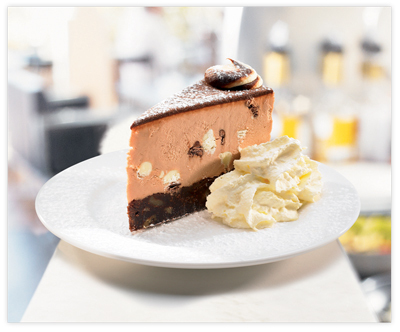 All offer superior service and an ambience which sets them apart from most other cafes. Customers love the friendly waiters, the wide choice of breakfasts, lunches and dinners and the sophisticated all day dining. Most are licensed, adding another dimension to The Coffee Club‘s appeal. So when people ask “Where will I meet you?” and the answer is “The Coffee Club”, it’s no accident! It’s a question asked by thousands of Australians every day. And more and more, the answer is The Coffee Club, as our Kiosks, Clubs and Cafe Bar Restaurants make their presence felt all around Australia and New Zealand. What’s the secret of The Coffee Club‘s success? Part of the answer lies in providing customers with exactly what they want. 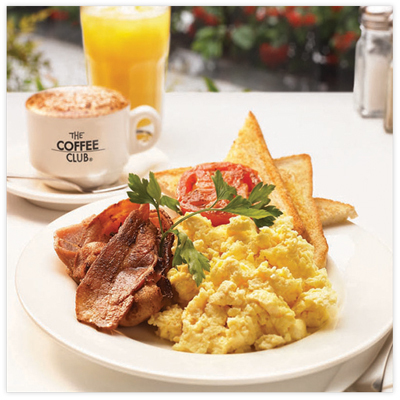 So if someone wants breakfast at 4 o’clock in the afternoon, it’s no problem at The Coffee Club Cafe Bar Restaurants. For those who want lunch well after sunset, they’ve come to the right place. After all, people don’t think about business lunches like they used to any more. Why should we? While good food, great service and excellent coffee are integral parts of The Coffee Club brand, there’s far more to it. The dacor, the affordability and consistent dedication to excellence have made The Coffee Club a great place to meet friends – or to take ‘time out’ and indulge in a little people watching. 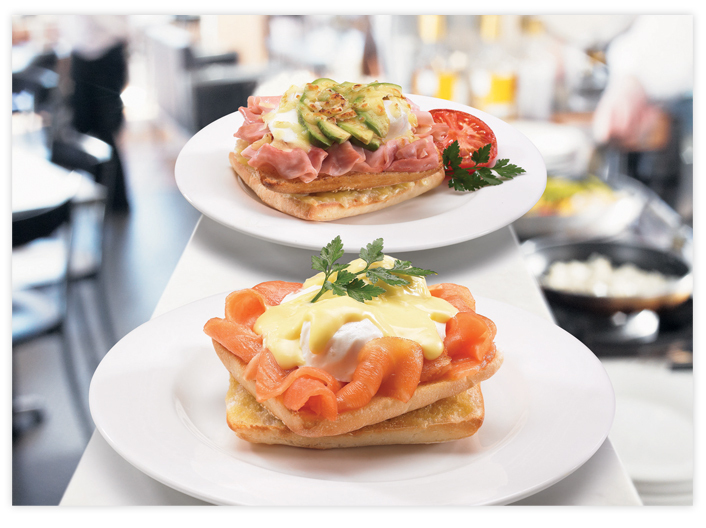 At The Coffee Club, customers can choose from a superb range of light meals, gourmet sandwiches, coffees, beverages and cakes. Coffee is in our name – so we’d better get it right! The essence of clubs has always been a sense of belonging. So we go out of our way to make customers feel right at home wherever they find The Coffee Club. We help bring out the best in your staff so high service standards are guaranteed. 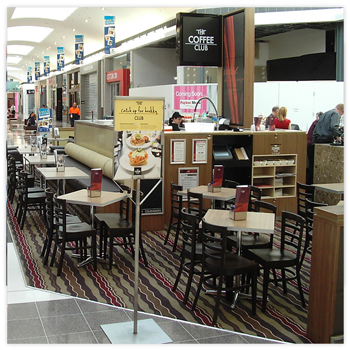 We provide superior shop design and fitout. And above all, we ensure that the international selection of fresh foods, fresh coffees and teas never disappoints. No wonder so many people are asking the question “where will I meet you?” and answering The Coffee Club of course! It’s a well documented fact that franchise businesses are far more likely to succeed than stand-alone ventures. But what makes The Coffee Club franchise system better than others? – At The Coffee Club, we continually strive to be a leader in the franchising and retail hospitality industries. We are constantly refining the way we go about our business. We’re always looking for better ways to do things. There’s another important difference. We believe the days of the ‘Big Brother’ head office are over. So we have developed a consultative business model where franchisor and franchisees work together to create an even better enterprise. It’s a comprehensive system that is firmly grounded in the principles of contemporary business planning, as we strive for ‘best practice’ in the retail hospitality sector. Franchisees are trained in each of these areas using contemporary teaching methods which emphasise ‘learning by doing’ and detailed manuals developed by the company. As a franchisee, you’ll also be supported by a team of franchise consultants. 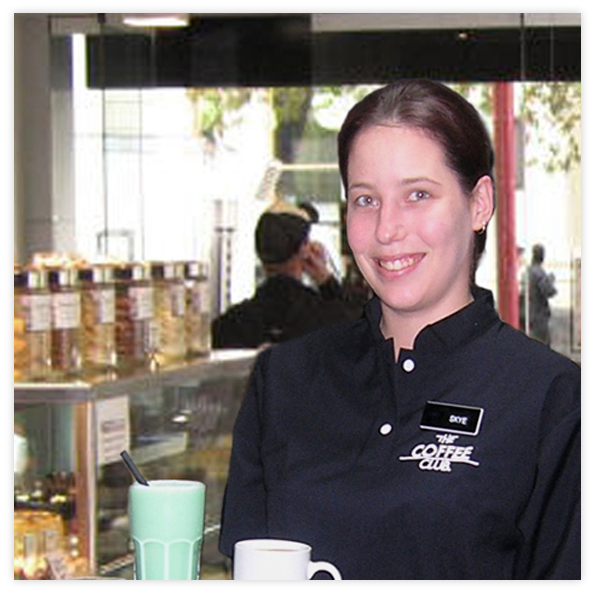 Members have been hand picked on the basis of their retail hospitality experience coupled with tertiary training. The Coffee Club franchise system is really all about the benefits that flow when like-minded people work together to achieve favourable outcomes. While our key responsibility as franchisor is to build The Coffee Club brand, we are equally committed to considering each franchisee’s individual needs. Ultimately, however, everything we do, we do in our customers’ interests. That’s why they choose to meet at The Coffee Club in the first place. It’s essential that they keep on doing so. 1. Franchise businesses have a greater survival rate than new independent businesses. Franchising is about risk reduction and safety – you don’t have to guess about the most effective way to build your business because there is already a successful system to use. 2. 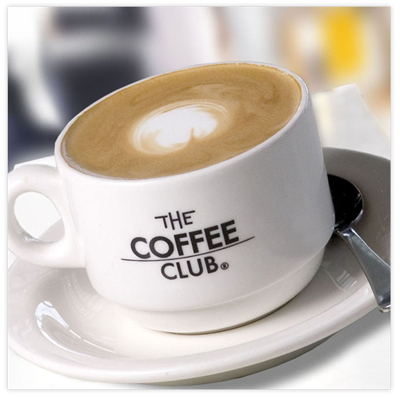 The Coffee Club provides a proven business model, a brand identity and trademark that have value in consumers’ eyes. You don’t have to reinvent the wheel to be successful. You provide capital, management, talent and energy to expand the brand faster than we as franchisor can on our own. 3. The Coffee Club has learned how to meet market demand for good food, great service and excellent coffee. 4. When you invest in The Coffee Club franchise, we provide all operating systems, technical expertise, marketing systems, management methods and all relevant information to make your business a success. 5. Such is the degree of systemisation that almost every aspect of the business is covered and nothing is left to chance. 6. We commit to provide you with initial and ongoing training and support throughout the life of the franchise agreement. Our training program ensures that you can implement our training systems easily. 7. Our group buying power will cut your operating costs compared with independent businesses. 8. Our tested marketing programs will ensure your business grows faster and has a greater chance of achieving forecast results sooner.